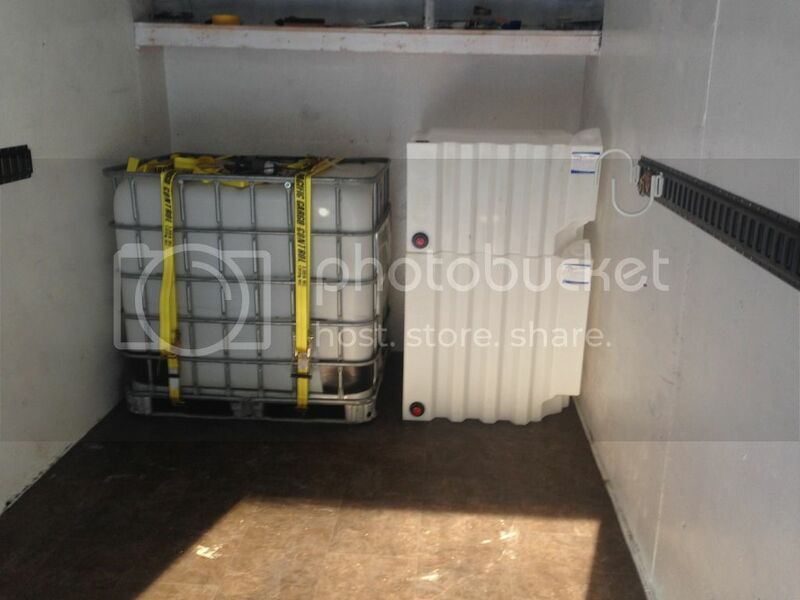 Thread: Box Truck or Enclosed Trailer Sealed Tank System...No More Fumes! So, when I decided to build a box truck based roof cleaning rig, the one thing that I was warned about by the old timers is that the Chem would eventually rot the box out. Even using coatings, it was still a significant problem. 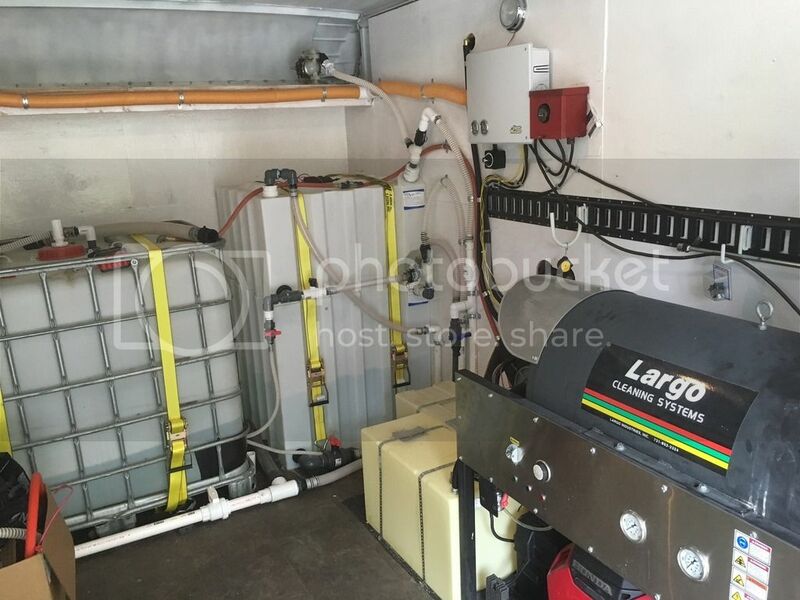 Then, one day I was getting a 300 Gallon fuel delivery on a job site for one of my machines (one of my other companies) and as the fuel truck was hooking up to the fuel tank, I was looking at the rig and seeing the external fill ports for the fuel tanks onboard. Then it struck me...if they can do that, why can't I? First, the tanks. In order for this to work, the tanks would have to omit the normal man way hatch on the top. Problem is, 99% of the tanks out there have that. But as I was going through the different catalogs and websites, I stumbled across Tote A Lube Tanks and browsing their website, realized they make stacking tanks without the man way cover! So...a 65 Gal and a 125 Gal tank were ordered. Along with a 265 Gal IBC, that makes up the tanks on the truck. Because the truck is square and the tanks are square, it all fits in perfectly. Tote A Lube 125 Gal Tank. 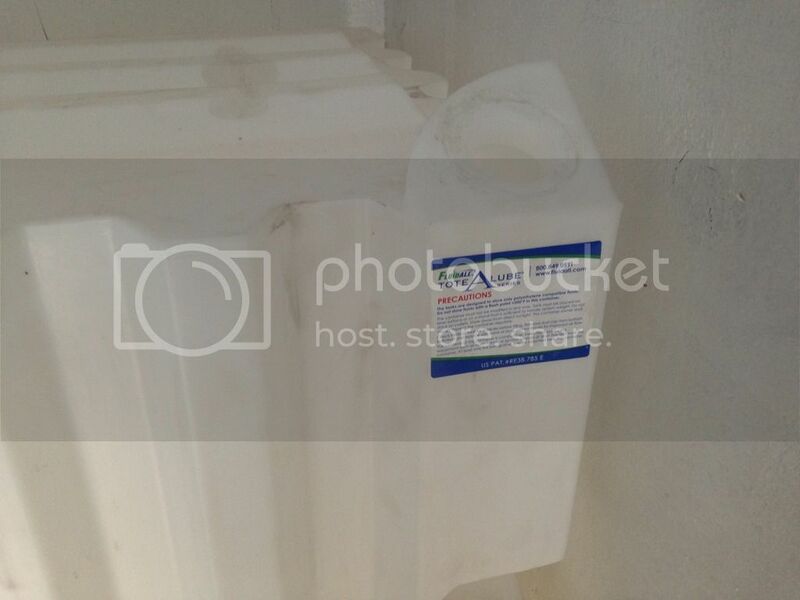 SH Storage and Roof Mix Tanks. Now came time for plumbing. Each tank gets its own vent so no cross contamination happens. One vent has a quick connect and valve plumbed in in order to evacuate the tank using the onboard roof pump if needed. Each tank also has a fill line with a chem appropriate backflow check valve. The top SH Storage tank is plumbed into the bottom tank with a valve. To transfer 12.5% SH into the mix tank, all the crew needs to do is open a valve. The IBC tank is filled from the other side of the truck. The fill line runs into a 3 way valve which allow the incoming water supply to be routed to either the tank or to an onboard 120V electric booster pump we use to rinse roofs. An external electric outlet allows a quick plug into the truck and pump. 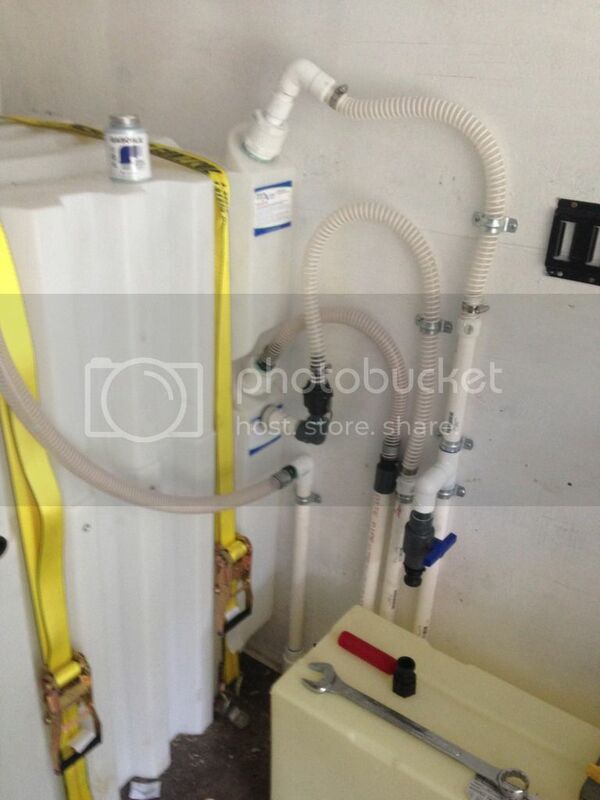 Tank plumbing being mocked up. I eventually went with Schedule 80 for the chem fill line to further improve the strength and chem resistance. 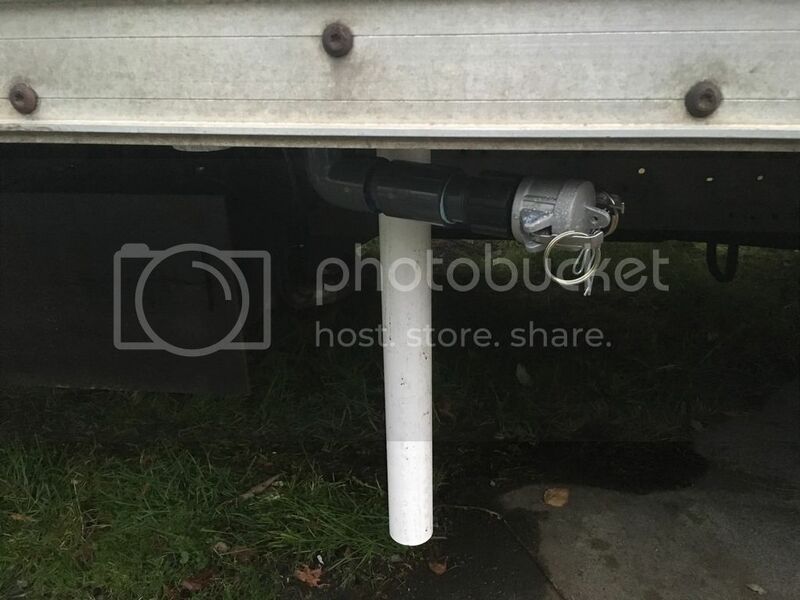 External fill connections for Mix tank water and SH. Cam lock connectors allow for quick hose hookup. A back flow check valve keeps most of the SH in the fill line if the crew forgets to flush the line. Buffer tank fill line. The PVC pipe is for the tank dump. The Truck as it sits now. 12 Volt distribution system with a battery isolator/charging system, master battery cut off switch, fuel gauges for the diesel and gas tanks. The fuel tanks also have external fills and venting. 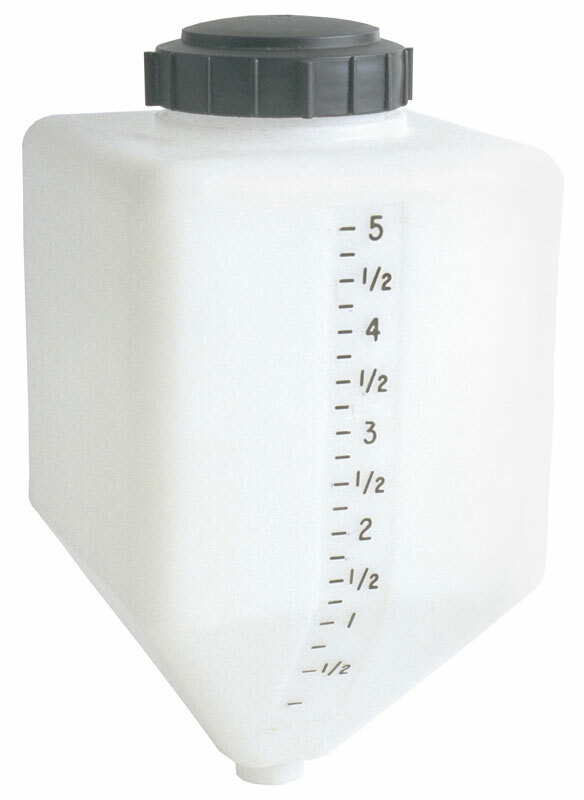 The small 1/4" air pump up top will serve to pump in the Surfactant into the SH tank for making roof mixes. Since I buy/sell/rebuild Air Diaphragm Pumps, I have a plethora of pumps going onto this truck. The small 1/2" feed line from the SH storage tank was going to feed the DS injector on the pump...but I am concerned about it going that far and not having enough draw. So, some small 5 Gallon flat back cone bottom tanks were ordered which will be mounted on the wall above the power washer. I'll use another 1/4" air pump to pump SH into the DS tank from the onboard 12.5% SH storage and we'll just pour the surfactant into it's own tank. Valves on the bottom of the tank into a Tee will allow me to switch between surfactant, SH or both. I might add another tank or two for degreaser/acid/etc. These tanks are a GREAT find by the way for anybody who doesn't want to have buckets on the truck to draw from. 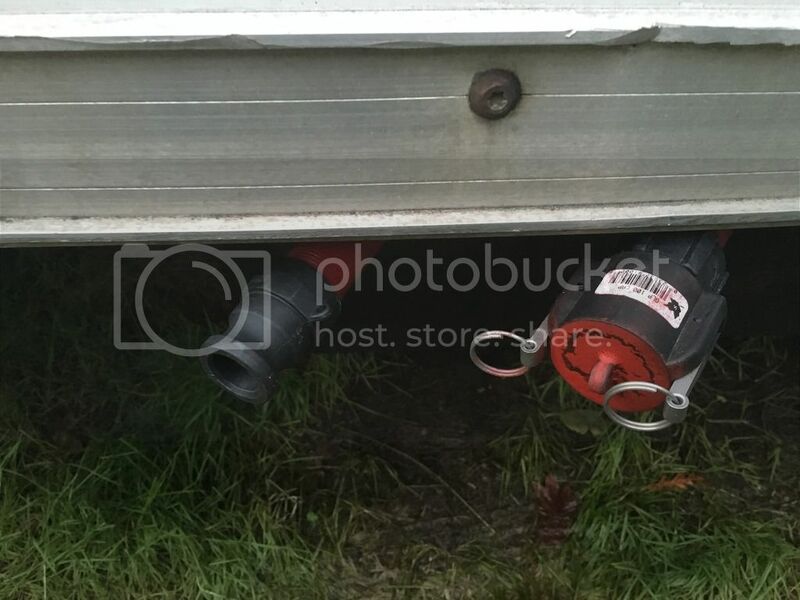 They have screw mounts on the back and I'll build a mounting plate for them and screw the mounting plate onto the trailer wall and just screw a valve onto the bottom of each one. There is also a feed coming off the 1.5" water line running to the pressure washer from the main tank which allows me to run fresh water through the DS line to flush things. They are only $52 each from Tank-Depot. I plan to seal the vented cover on the SH tank, install fill and vent ports and vent it externally as well to keep the fumes out. The past few days, I've been driving the truck around to job sites for my other company with 1/2 full water tanks and 3/4 full fuel tanks to test all the connections. Thus far, even with a panic stop (IDIOT!) everything is leak free and no fuel fumes at all. Next step is the air screw compressor and the exhaust for the Dragon, plus a lot of reels. Hopefully this helps guys who are trying to build a roof cleaning rig on a box truck or trailer...or you are starting to see rust, or you are sick of getting gassed out inside your truck. Asphalt and Cedar Shake Roof Cleaning. Serving Whatcom, Skagit, Island, Snohomish and King Counties including Bellingham, Ferndale, Lynden, Sudden Valley, Mount Vernon, Seattle and Surrounding Areas. Safe. Non Pressure. Premier RCIA Member. Very nice... Great job!!!!!!!!!!! Keep us updated with the progress and can we have a first name??? Serving Central and Southern Anne Arundel CO.
Mike, this is Kevin Enderle. I am reasonably active on the Facebook Powerwash forum and one of the Mods at the RCIA Roof cleaning forum.mlot of folks also know my Pump Man Air Diaphragm pump business. I will add my name to the Sig. Thanks Kevin. I admire your set-up. Very well thought out!!!!!!!!!!!!! That is a camera effect. It is a standard width 15' Supreme box on an NPR. First class rig very well thought out great job. I there any chance that you can re-host the photos? It appears that they do not show up because of a host sharing issue. I came across your build while doing research to get ideas for setting up an NPR box truck that I will be moving my business into over the winter months. Is Kevin still around? I know he disappeared off of Facebook for a while.